Over 350 people participated at one or more stage during the walk. There were nine events along the way, each with powerful speeches, imagery and symbolism as well as important knowledge shared. At the start and end of the journey, Dharawal man Lyle Davis gave us the water from Cataract Dam, and he took it back at Hyde Park fountain, drank it, and poured it in. On Thursday an interfaith ceremony brought together water from the Ganges and from Mecca among other special places, mixed in the common bowl, to remind us of how water evokes the sacred in our different spiritual traditions. The water was carried for 165 km, and Michael with the help of Antony saw it through for the journey. Along the way we had numerous conversations- with gardeners from Holroyd Council who we exchanged campaign material with (they are against amalgamation and are worried about losing their jobs) as well as union workers concerned about privatisation. We workshopped poems and told stories. A papier mache Coalhead was there, Uncle Sam was there, a working model of longwall mining operation damaging water supply was there, as well as Beyond Zero Emission’s model of a solar thermal power station which turned up at least 4 times along the way (Thanks Terry). The walk were covered by 10 different articles in local newspapers (some were syndicated, making the total higher than 10), including one front page article and picture in the Auburn Review. It was also covered by online site Independent Australia.net.There was also coverage by the 2GB network during the walk, with a great interview of Julie Sheppard about the coal mining threats to the Cataract Dam. One of the politicians we met along the way, [I think it was Guy Zangari] told us that one of his constituents was badgering him on the street soon after that interview about water catchments. I haven’t yet totalled the number of politicians or candidates we engaged with at various levels from lobbying to having them speak… I’m guessing more than fifteen. WOW! 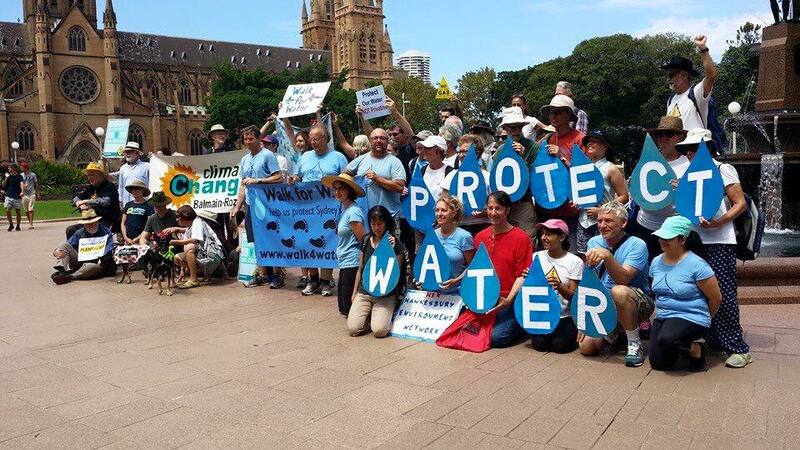 Baird just cancelled the three CSG licences covering Sydney Drinking Water Catchments – 442, 444, and 454! How about that…and there’s still 2 weeks to go before the election. NOW to stop any coal expansion in our catchments…fingers crossed for Wollongong Coal expansion PAC recommendation which will be out soon. This week is a good time to reflect on the Walk for Water, and celebrate our achievements together with the broader movement. Please think about 1) what happened 2) how to improve 3) what to do next. You might want to write something and send it to us, or bring it along on the night, or just bring your thoughts. Friday March 20, 6pm for evaluation, 7pm for dinner. Come to one or both. Himalaya Restaurant, 5 Good St Granville – 1 minute walk from station. PS HUGE thanks especially to Antony Lewis (logistics, police liaison, route, filming, donations, Thursday interfaith event), Michael Streatfeild (logistics, media, route), Michael Rynn (driving van), Anne O’Brien (website, leaflets, meeting convenor), Isabel McIntosh (social media, encouraging us to participate in the Wollongong PAC hearing), Julie Sheppard (fact checking and Saturday’s event) Marina Farid and Dan Robins (Sat BBQ and Sunday’s event), Maria and Richard Maguire (Wednesday’s events), Leah Briers (Thursday interfaith event), Janet Ellis (Friday), Annie Nielsen (Saturday morning’s events, grant application, printing, logistics), John Carroll (treasurer, speaker on Thurs), Jules Wright, Kaye Osborn. Thanks also to the Nature Conservation Council of NSW for their support, particularly for the support with media (James Tremain) and with their generous grant. PS some of us are going to see Frackman this Thurs in Campbelltown. Tickets are selling fast. You might be interested in joining us!